Kobie Bivings was a very bright, caring, loving, humble, and athletic child who loved the outdoors. He was diagnosed with Metastatic Squamous Carcinoma in March 2015. Late January 2015 he was experiencing lower back pains, he underwent many testings, radiology, and x-rays and stumped doctors because they didn’t know what was causing his pain. Finally, the CT scan revealed that the answer was cancer. Kobie faced a very tough and painful battle. His first biopsy read negative for cancer, so more testing was done and still nothing. Every test was coming back negative. Finally, a second biopsy was performed and after 2 weeks of waiting for results, the doctors confirmed that it was cancer. At that point, his cancer was terminal and he was to immediately be put on Hospice. After a month of staying in the hospital, he lost almost 20lbs weighing in at only 79lbs. The doctors said there was nothing more that they could do. At that point, we decided to let Kobie live the rest of his days doing whatever he wanted to do. One of the first things he had in mind was to go home and go fishing and we did just that. Kobie had tumors on his spine and ribs that had compressed his spinal cord and severely damaged his bones. He had to wear a metal brace for his back and was required to be in a wheelchair. One morning in May of 2015, Kobie woke up and said he couldn’t feel or move his legs. We soon discovered that he had became paralyzed from the waist down and he surprisingly took it better than we expected. Even in his condition, he was still so very independent in his everyday routine and especially with his daily hygiene. We all lived day to day and every day was different. We had good days and bad days. There were many days when he would wake up and go to bed crying, days when he wouldn’t sleep because he was afraid he wouldn’t wake up the next day and days when the only thing he wanted to know was “Why me?” or “Why is there no cure for cancer?”. During his battle, Kobie had one goal: to graduate from high school. Even though he was confined to his bed and experiencing severe pain, Kobie would refuse his pain medication just so he could stay up to do work with his tutor. He was always eager and ready to do his schoolwork and even on the days his tutor wouldn’t, Kobie stuck to the schedule and did schoolwork. He was able to get caught up on all of the work he missed during his junior year and worked on completing his credits for his senior year. One day Kobie stopped breathing. His father was able to revive him and they rushed off to the hospital where he stayed for two weeks. During his stay at the hospital, his teacher informed us that Kobie had completed all of his requirements for graduation a week before he was admitted. 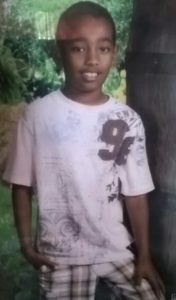 A few days later, his teacher and schoolmates arrived at the hospital to visit him and present him with his high school diploma. HE DID IT! His hard work definitely paid off and it was no surprise. 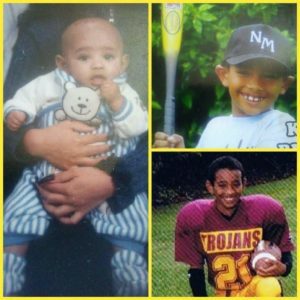 At the age of 16, Kobie had graduated from Ka’u High School. Two days later, on September 06, 2015 at 6:02 am, we watched him take his last breath of life. He left as an inspiration and a role model to his siblings and to so many others and he taught us all how to never give up! 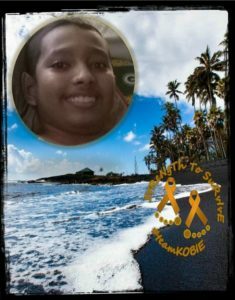 Kobie was blessed by many with love, support, and gifts and with this foundation it is my goal to continue to inspire children and families, support existing programs, provide support and resources for children and families fighting cancer, raise awareness for childhood cancer, and raise funds to help find a cure for our precious golden angels. As a local program of the American Childhood Cancer Organization (ACCO), Strength To Survive Childhood Cancer Foundation is privileged to support the programs they offer for families across the country. ONE LOVE, ONE FIGHT… Together let’s unite because these kids should never fight alone. If you know of a child with cancer who is interested in receiving a beautifully handmade beanie hat please contact Emely Salmo at (808)-345-4325 or email strengthtosurviveccf@yahoo.com.